Two things are certain in life in the optical industry, taxes and warranties. While we can't help with the taxes, our 50 years of experience has helped IcareLabs make your warranty and credit process as easy as possible. With our credit form you'll be able to easily ensure your account is credited properly. After logging into the MyIcareLabs customer portal you'll be able to print out our credit form as needed by clicking on "Credit Form" in the blue functions box to the left (pictured above). For our finish accounts, you'll be able to go ahead and start the redo on the job as we do save the tracings. You'll be able to fill out our credit form and receive credit by attaching the completed form to the lenses then sending it back to us with one of our pre-paid UPS labels or any shipping option you prefer. Transitions lenses are guaranteed to perform to manufacturers standards for a full 2 years and all Crizal anti-reflective coatings are covered for a full 2 years as well. All of our featured and digital progressive lenses (which include Varilux, Essilor, Kodak, Seiko, Shamir, Heritage, and Legacy) provide your patients with a 90 day, one time non-adapt and a 90 day, one time doctor's Rx change. Value progressives do not include this and are self-warrantied. All plastic/CR39 lenses with added scratch coat as well as polycarbonate and high index lenses receive an included 1-year, one time 50% scratch warranty. 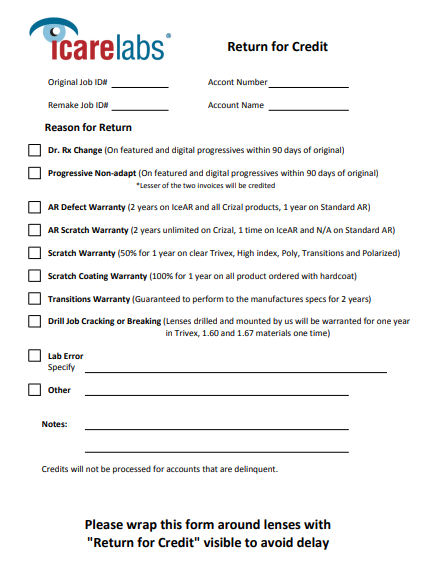 Adding additional scratch coat protection to poly and high index upgrades the warranty to 1-year, one time at 100%. In the rare instance you receive a job with an unlisted warranty or lab error you'll be able to specify exactly what the issue is in the space provided on the credit form so we can quickly take care of it for you and your patient. We do ask that all lenses are returned with a completed credit form which helps us see where the issue arose from so we can correct it moving forward. One thing our customers love is not having to call in for every warranty or issue. They know as long as our credit form is included with the lenses when sent back, their accounts are credited accordingly. Of course, you can always reach out to our customer service team to let them know what is going on or with any questions you may have regarding our policies or help with your account or a job. 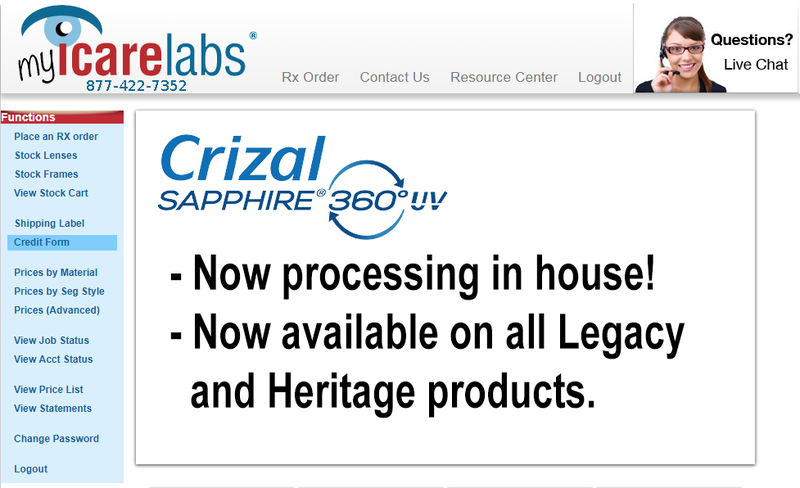 CLICK HERE for our complete MyIcareLabs.com customer portal overview. Download our optical price list and you'll get an idea of the money you could save on your largest monthly expense: your lab bill!